(Carson) – Derwin James made the hit, Isaac Rochell made the interception with just over two minutes left and the Chargers secured a 29-27 win over San Francisco Sunday before a sold out crowd of 25,397 at StubHub Center. 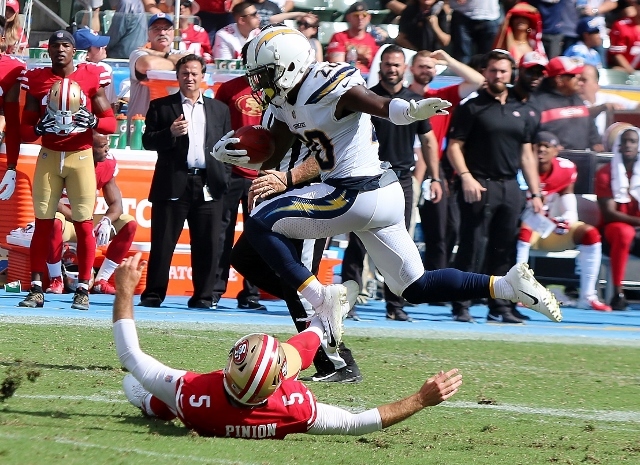 The Chargers picked up a first down and were able to run out the clock from there, but it wasn’t until that play that LA was able to breathe easy against a 49er team that wouldn’t go away. The Chargers were down 14-0 before they knew what hit them and then had to battle back. The 49ers got a quick jump. On the Chargers first possession Dante Exum Jr. intercepted Philip Rivers and returned it 32 yards for a touchdown. Just like that the pick six gave the Niners a 7-0 lead. After Caleb Sturgis was short on a 54-yard field goal attempt, San Francisco drove 56 yards in six plays with C.J. Beathard hitting Kendrick Bourne on a two-yard touchdown pass to make it 14-0. The Chargers marched 75 yards on the next series with Rivers finding Antonio Gates for a five-yard scoring pass to cut the lead to 14-6 just before the end of the first quarter but Sturgis missed the extra point. Robbie Gould booted a 21-yard field goal when a 49ers drive stalled at the Charger four -yard line for a 17-6 lead with 4:59 left in the first half. Then LA began to chip away. The Chargers put together a 75-yard drive as Rivers fired a 23-yard touchdown bullet to Austin Ekeler with 47 seconds left in the half. Rivers connected with Melvin Gordon for the two point conversion. It appeared the 49ers would take that three point lead into the break but they punted with 30 second left and Desmond King II returned it 55 yards down to the San Francisco 32. Sturgis was true this time kicking a 48-yard field goal to tie it at 17 as time ran out on the first half clock . The Chargers took their first lead of the game in the third quarter. A short punt and good return put them at their own 49. From there they went 51 yards in six plays. Rivers hit Gordon again – this time on a six-yard TD pass for a 23-17 advantage. Sturgis’ struggles continued as he was wide right on the extra point. San Francisco drove deep into Charger territory on the following possession but Trevor Williams picked off a deflected Beathard pass at the goal line and returned it all the way down to 49er 12 yard line. The ball went in and out of the hands of the intended receiver and into the waiting arms of Williams who was off to the races down the right sideline. From there the San Francisco defense held and Sturgis found the uprights this time from 22 yards out. The 49ers responded with a big play. Beathard found a wide open George Kittle running up the seam. He caught the ball in stride and outran the LA secondary 83 yards for a touchdown to cut the lead to 26-24. Beathard was knocked out of the game when he took a shot early in the fourth quarter. Gould kicked a 33 yard field goal when Beathard failed to get the first down on a scramble as the Niners took a one point lead. On the next series a big run by Gordon set up a 21-yard field goal by Sturgis and the lead changed hands again with the Chargers on top 29-27 with 7:41 left. D.J. Reed appeared to fumble the ensuing kick off as Nick Dzubnar recovered it. But on a review it was ruled that Dzubnar never had possession as he was going out of bounds and San Francisco retained possession. However the 49ers didn’t take advantage and were forced to punt three plays later. 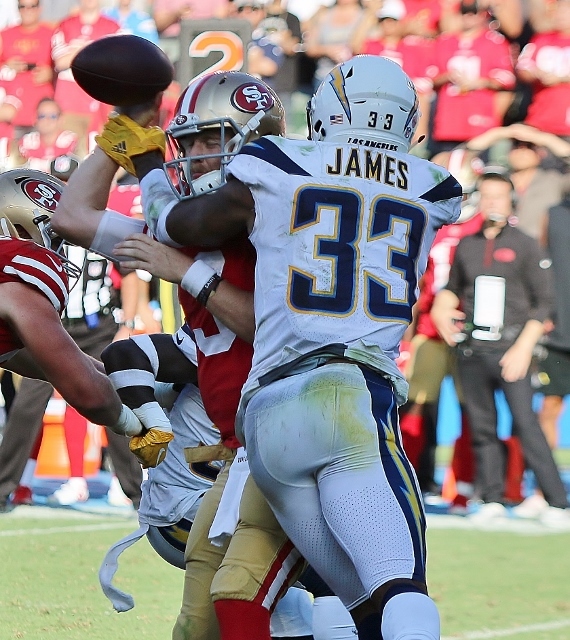 After the Chargers were forced to punt, Beathard, who was back in the game took the hit from James as he was releasing the ball and it was picked off by Rochell and the Chargers took over at the 49er 19. 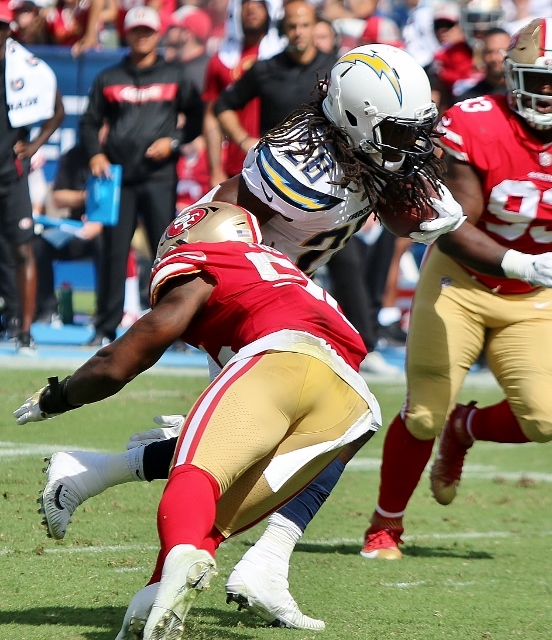 The Chargers took a knee on the last three plays with the Niners out of time outs and they had their second win of the season. Rivers completed 25 of 39 for 250 yards and three touchdowns and an interception. Gordon rushed for 104 yards on 15 carries and had seven catches out of the backfield for 55 yards and a score. For San Francisco Beathard was 23 of 37 for 298 yards, two touchdowns and two picks. The 49ers had just 76 total yards rushing. “It was good to see the resiliency of this team and how they bounced back. We played good complimentary football,” said Chargers head coach Anthony Lynn. The Chargers improved to 2-2 with the win while San Francisco fell to 1-3. LA hosts the Oakland Raiders next Sunday.